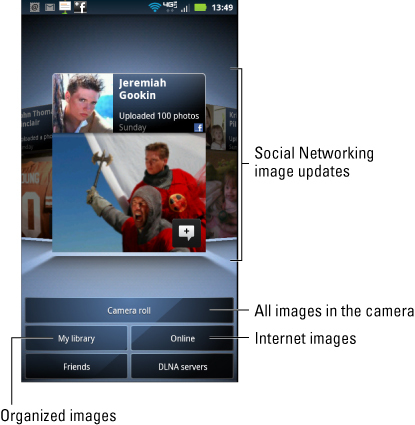 The Droid Bionic’s Gallery app is the main place to go for looking at pictures and videos on your phone. They can be images you’ve taken with the phone or images synchronized from social networking sites, photo-sharing websites, your computer, or a variety of other sources. The Gallery apps lets you look at the pictures and view the videos, but also organize them, edit them, and eventually share them with the known universe. To start the Gallery app, choose it from the App menu. The Gallery’s main screen is shown in this figure. The primary part of the screen (at the top) displays image updates from your social networking sites. You can scroll these images by flicking them left or right. To view the images and videos you’ve taken with the Droid Bionic, touch the Camera Roll button. This figure illustrates the Camera Roll screen. Touching a thumbnail in the Camera Roll, or any similar display in the Gallery app, displays the full-screen image or presents the video for playback. Flick the touchscreen left or right to page through full-screen images. Press the Back soft button to return to the thumbnail overview.